I’m asked all the time about my own personal compassion fatigue. It doesn’t come from where you might think. Some of you know that one of my passions is being an advocate for farm animals. I’ve been involved with a farm animal sanctuary for 5 years now and I put my passion to work as a tour guide, guiding visitors around the 85 acre property and introducing them to our 200+ residents. 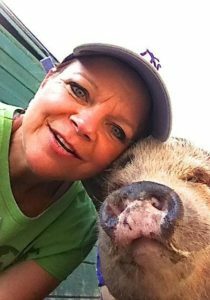 All rescued farm animals from abuse, neglect and hoarding situations. I call the sanctuary my “happy place”. I didn’t grow up on a farm so to be honest, I didn’t know farm animals. I’d never really met a chicken or a turkey or a pig or a cow other than at a fair I guess. I didn’t know chickens like to ride in the car and drink ice tea out of your cup (not mine, our founders) and that they have over 30 different sounds to communicate with each other not including the the unique sound they have for each other (a name you could say). I didn’t know pigs were not only extremely intelligent (#4 in the animal kingdom) but also extremely emotional. They grieve for their friends who have died similarly to elephants. Nothing makes me smile more than when they grunt and snort and in response to you talking to them. What I learned very quickly in spending time with farm animals is that the are just like dogs and cats and me. We all want to feel joy, have friends, enjoy the sunshine and fresh air. We all also feel pain, discomfort and fear. Last week due to Hurricane Florence 3.4 million chickens and 5500 pigs drowned in NC factory farms. Although there was ample warning, it appears as though nothing was done to help these helpless beings. Apparently insurance covers the farmers loss so I’ll let you make your own assumptions about how motivated they were. Whether you eat animals or not, this blatant disregard for the welfare of these animals is unconscionable. Can you imagine the response if this many dogs and cats drowned in animal shelters and no one did anything to help them, despite ample warning. Every single one of us has made the welfare of animals our personal mission and purpose on this planet yet the welfare of the most plentiful animals on the planet (farm animals) is being ignored. I get it. It’s easier to look away. If they were dogs and cats, we’d be outraged. Yet how are they that different? THIS is my personal compassion fatigue.